Herbs are a garden must. They are fragrant, savory, beautiful and tasty. In some cases they have medicinal and spiritual qualities. They have been incorporated into spiritual rituals and medicinal practice around the globe for thousands of years. Herbs differ from vegetables because they add flavor, not sustenance to your diet. Some herbs take on different flavors and can be considered an herb during a certain growing phase and a spice during a different phase. One example is cilantro, a necessary flavor accent to many dishes. It tastes floral and citrusy when in its leafy young plant form. As cilantro matures and produces seeds, the seeds are actually coriander, a spice incorporated into much Asian and South American cuisine. To me, summer eating revolves around everything fresh. Door County is in the perfect climate to produce the crops to supply the markets and also allows us to grow our backyard gardens. The growing season gives us an abundance and a variety of delicious vegetables and fruits to keep our palates satisfied throughout the warm months. My spice cabinet is a definite staple in my kitchen when preparing food, however, during the growing season it gets placed on the backburner while my garden fresh herbs step into the spotlight. They are easy to grow in the ground or in pots. Some varieties such as thyme and chives are perennials. Some varieties will regenerate after a mild winter while most (basil, rosemary and cilantro) in this climate are annuals. As you plan menus and find yourself wandering through the market or your own backyard, make sure you have a plethora of herbs at your fingertips. 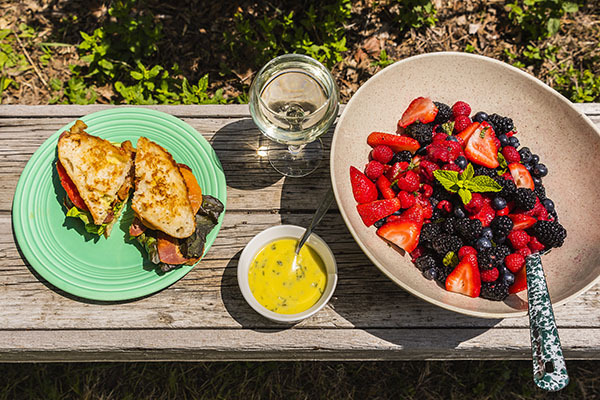 Celebrate your garden by accenting your meals with fresh herbs.You do not need much to transform the flavor of your garden bounty into a complex flavor explosion on your tongue. Herbs pack a fabulous and flavorful punch! Remove all leaves and stems. Wash and remove excess water from the berries. Place in a large bowl. 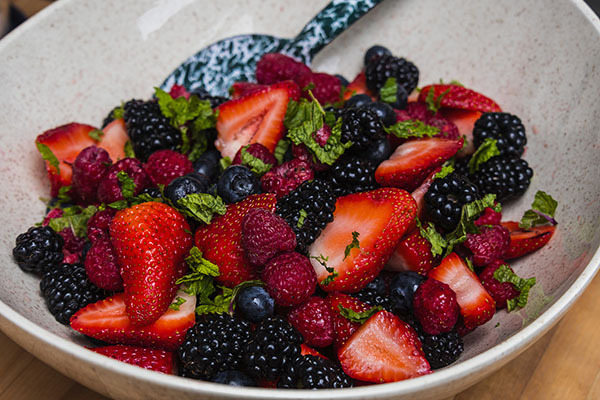 Drizzle the honey over the berries and gently stir (berries are fragile; use a light touch). Rinse the mint and remove excess water. Bruise the leaves (this process releases the flavor), chop and sprinkle on the top of the berry medley. This salad is a delicious addition to any summer breakfast or picnic. *Mint is easy to grow and there are many varieties. Use caution if you are planning to plant it in your garden, it is extremely invasive and will take over if given the chance. I would recommend growing your mint in a pot. When the tomatoes start coming I know I am not the only one who wants to eat BLT sandwiches every day. 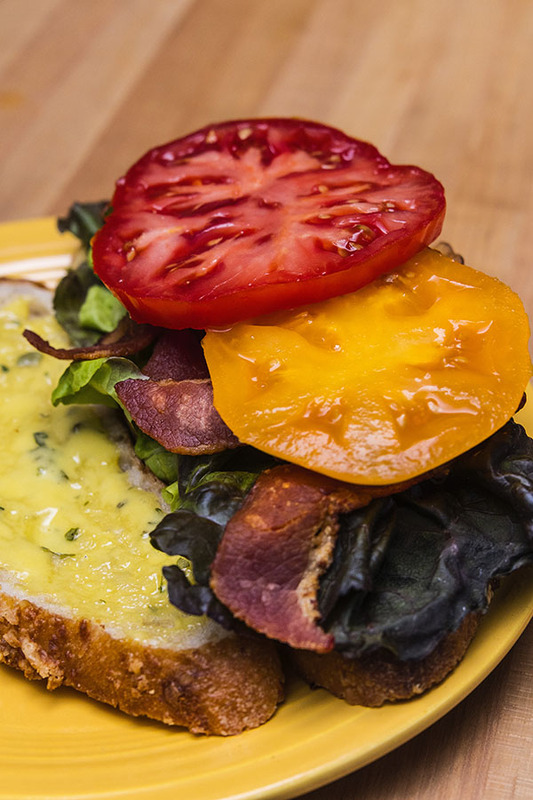 The BLT is the best of all worlds coming together in perfect harmony, and then you get to eat it! The months of bacon deliciousness are now. 2 slices bread — as much as I gravitate to whole grain options for almost everything. This sandwich is best with a fresh baked crusty French or sourdough lightly toasted or grilled. lettuce — I prefer a leafy variety for the crunch and add a bit of arugula to spice it up. 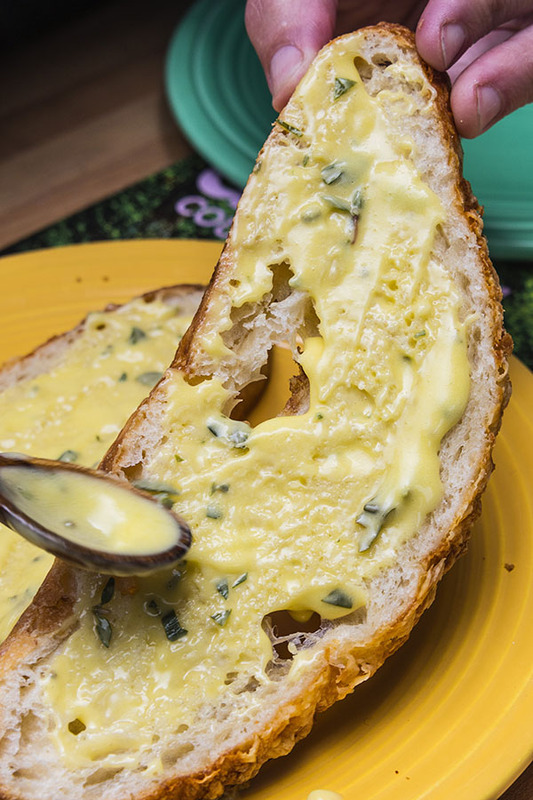 Lightly toast or grill the bread in a dollop of unsalted butter. Spread a layer of herb mayo on both slices of bread. I like to layer in this order — tomatoes (salt and pepper to taste), bacon and then the lettuce. This gives the tomato juices the opportunity to soak into the bread, yum. Fold the sandwich together, slice in half and enjoy. You will need an electric mixer or be prepared to get a wrist workout when whisking the ingredients together. You can use whichever herbs are your favorite, I prefer thyme and basil in this savory sandwich spread. Using your mixer with the whisk attachment, combine the egg yolk, lemon juice, vinegar, mustard and a pinch of salt. Mix until blended and yellow in color, for approximately 30 seconds. Using a small spoon, add ¼ cup of the oil, a few drops at a time while whisking constantly — this will take minutes. Then add the remaining oil by slowly pouring a thin, steady stream while continuing to whisk at a low speed until the mayo thickens. This step can take up to eight minutes. Add the fresh thyme, basil and garlic. Technically this is considered an aioli, not a mayonnaise. The difference is in the oil you choose to incorporate. Mayo traditionally uses canola oil while olive oil steps it up to an aioli. Aioli traditionally includes garlic and mayonnaise does not.